It’s been a hot, beautiful summer across much of the south. Temperatures ran above average with rainfall well below; ideal weather for most outdoor activities. Limited rain early in the season baked my lawn, reduced mowing time and provided more free time for fishing but that’s where the good news ended. 2014 was one of the toughest years for summer fishing I can remember. Lack of rain held water generation rates down on the upper-TVA system and free-flowing rivers became crystal clear and shallow, encouraging dense aquatic weed growth. Both provided good conditions for anglers who wade and fish for trout, smallmouth bass and others, but created impassable conditions in most places for those with jet-drive outboards. Several trips to check various sections of my favorite smallmouth river produced disappointing results. When we caught respectable numbers of fish the average size was below normal, partly because we were limited on where we could fish. The river sections that normally produce our largest smallmouth bass of the season were inaccessible this year by jet-drive because of reduced flow and heavy weed growth. Even my favorite section of big carp water was so filled with weeds it was unfishable. This was the summer I wished I owned a Kayak. Night-fishing on reservoirs for smallmouth bass was equally challenging. Local highland reservoirs eventually reached full pool but hot weather drove surface water temperatures to well above normal. We adjusted and fished deeper to catch many bass but our catch rate of big fish, those pushing or above four pounds, was less than normal. So when September brought the first cool night air, falling surface water temperatures and increased generation to drop reservoirs to winter pool, I was eager to find improved fishing and some larger fish. Soon after water generation increased, tail-water fishing began to improve. 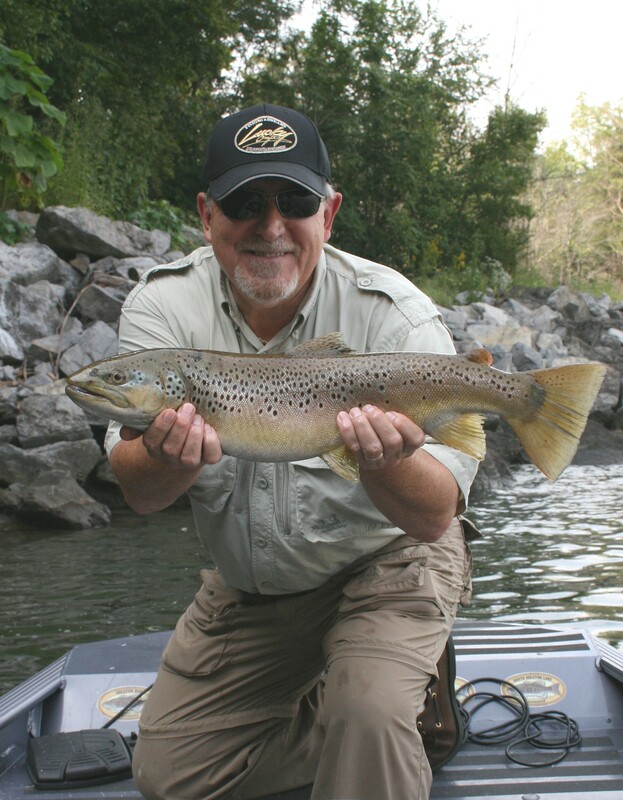 The flow of cooler water drew fish into shallow, fast water and on our first trip to check my favorite local tail-water we caught a nine-pound hybrid and several trout. On our second trip, on our first drift in the fast water, a big brown trout smashed my minnow lure so hard it almost jerked the rod from my hand. I looked back in time to see the angry fish clear the water by two-feet and the battle was on. It was one of the hardest fighting browns I can remember with multiple water-clearing cartwheels and line-stripping runs. When we finally netted the twenty-five-inch-plus beauty I was trembling like a shy teenager on a first date. Fishing improved so quickly, I talked my wife Tammie into making a short trip after work one evening to try catching some fast-water trout. True to her reputation, she soon caught a beautiful male rainbow, as if it were no big deal. If you’ve not read my book, there’s a story in the last chapter that recounts how Tammie learned to fish and eventually earned the nickname, “Big Fish Woman”, emphasis on “Fish”, not “Big” as she always explains. Our success in that tail-water soon had me wondering when the exciting fall topwater fishing on area lakes would begin so I decided to visit a favorite reservoir and begin the search under the next major moon phase. My goal was to find some surface-schooling striped bass or hybrids. A week later, on a mild, partly cloudy afternoon two days after a new moon, a friend and I launched his boat in the headwaters of a local reservoir. Surface water temperature at the ramp was in the low-seventies; not as low as we had hoped but close enough I thought we might find some surface feeding black bass or hybrids. We ran down the narrow lake arm until we found a broad, open section with a large cove, a place that should attract some shad and schooling predators. As we idled across open water, the depth finder showed clouds of baitfish close to the surface and an impressive concentration of larger fish below them. There was no question this area was going to provide some good fishing when the feeding blitz began. However, the temperature had increased since we’d left the ramp. In my experience, the best surface feeding action in fall begins as the water temperature falls through seventy degrees into the mid- and upper-sixties. We sat and watched for breaking fish for more than thirty minutes and covered one point with casts where we saw some smaller fish feeding. But soon we decided to move on. Further down lake the temperature increased further and though we found many schools of baitfish dimpling the surface, they were very small and the larger fish we expected to see below them were absent. It was time to change strategies. After discussing our options, we decided to move back up the lake into the headwaters to a place where my friend and his wife had seen surface schooling shad the previous week and we had found some striped bass during late-summer last year. It was shallow and hazardous, more river-like than lake, but the shad were still there and my confidence increased when I noticed the water temperature had dropped below seventy degrees. So we slowed and moved ahead, though the waning daylight was beginning to make navigation even more hazardous. Soon, it became so shallow we turned off the big motor and cautiously moved forward with the trolling motor. We decided to continue as far as depth would allow, then cast our way back out toward deeper water. By the time darkness fell, we were in water less than three-feet deep in a river little more than two casts wide so we slowed the trolling motor to a crawl, grabbed our rods and prepared to start casting. My friend grabbed a long spinning combo rigged with a five-and-a-half-inch Storm Jointed ThunderStick and I a heavy baitcasting combo with a seven-inch Cordell Red Fin. 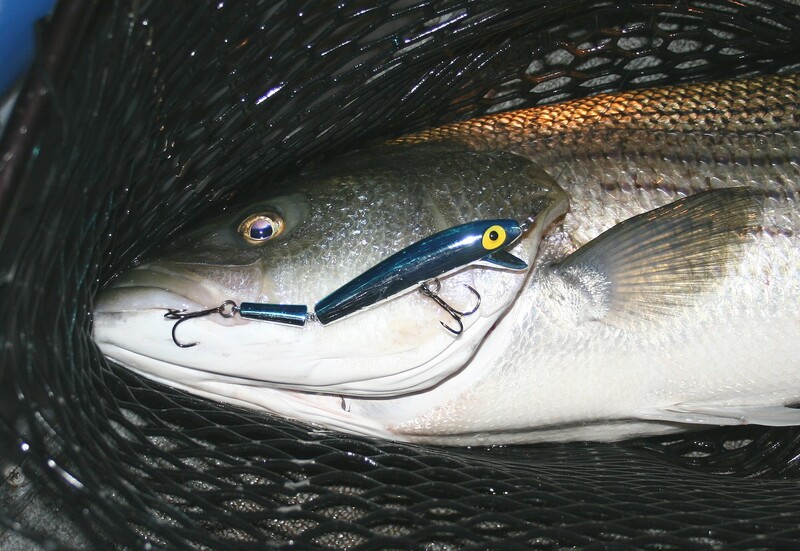 If there were stripers or hybrids present, one of these lures retrieved slowly along the surface should elicit a response. Expectations were high when we made our first casts but we didn’t expect what was about to happen. Several casts into our adventure, the water exploded under my friends ThunderStick and “Fish on!” echoed through the darkness. But after a brief, thorough thrashing of the water, the big fish pulled free. Two casts later, a big boil rose beneath my Red Fin, but the fish didn’t touch the lure. Whether they were stripers or hybrids, I knew they could be very size-selective and quickly exchanged my baitcaster for a heavy spinning combo loaded with the same Storm ThunderStick. In minutes my rod bent under the weight of a fish, a small striper between three and four pounds. Soon after my friend landed another; a hybrid between five and six pounds. In the next few hours, the topwater action we experienced was nothing short of incredible and the stripers got larger as the night progressed. We moved slowly upstream and later learned we were in the last hundred yards or so of water deep enough to float the boat, or hold fish. So when we finally reached the farthest point, we turned the trolling motor off and quietly drifted back downstream. Several times, large wakes streaked across the shallows in the dim starlight and we could see baitfish leaping clear of the water to escape. We had several more hits and misses but landed four striped bass between eleven and eighteen pounds. The most impressive event of the evening occurred around midnight while drifting silently downstream. We cast simultaneously toward the far shoreline and our lures landed not more than thirty-feet apart. After a short retrieve, both lures exploded as if on timers. We’d already caught several good stripers but quickly realized these must be older relatives, perhaps grandparents. My fish turned and headed down the river so fast I had no time to react. In seconds, it stripped off thirty feet of line as if my reel had no drag and then pulled free. My partner’s fish decided it wanted to play first. After a few energetic wallows, short screaming runs and an explosion or two, the giant simply spit the lure back at him at boat side. That’s little exaggeration because there wasn’t much left of the hooks on the plug; just fragments of twisted metal. And the split ring mounting loop on the front of the plug was bent at a forty-five degree angle. I was surprised the split rings weren’t straightened and gone. It was an impressive display of power by two huge striped bass. Several nights later, we returned for a rematch. This time we brought two boats; my friend with his wife, and I in my boat with frequent fishing partner Andy Barnes. Both our passengers had limited experience fishing for striped bass but were about to be fully initiated. In the next several hours, we collectively boated thirteen stripers up to fifteen pounds. I had another mid-teen fish pull free at boat side while Andy stood ready to net it. I waved it off as a victory because the fish had fought to near exhaustion. After quickly checking the hooks for damage, the topwater minnow again sailed into the darkness; no time to pout over a lost fish when the next cast might produce another. We all had more blowups and a few fish were lost but it was one of the most memorable trips I’ve had fishing for striped bass. This trip was made most special because we introduced newcomers to the exciting topwater fishing these powerful game fish offer. And the occasional shrill screams of a female voice echoing through the darkness made me chuckle every time. Later, as our companions drifted by us to leave, my friend’s wife started describing all the things she’d experienced. Her dialog began before we could hear her well, continued as fast as she could talk while they drifted slowly by, and finally dimmed into a series of high-pitched notes as they disappeared into the darkness. It was hilarious to hear that level of excitement in a grown woman’s voice. I was happy for her and proud of what she had achieved. Many days of rain and high winds kept us from returning to our newly found striper honey-hole though we were impatient for one last visit before draw down of the lake erased the possibility. I was also concerned the cooling weather would drop the water temperature low enough the stripers would disperse back into the lake. So one calm, overcast evening when Andy called and said he could spring free for a few hours, we scrambled to pack the boat and leave for the lake. What we found was disappointing. The lake had already dropped so low that our previous fishing area was no longer accessible. After repeated attempts to find a channel deep enough to reach our hotspot, we decided to start fishing as far upstream as possible and fish what we could. We had a few boils on our topwater minnows but landed only two stripers. But to end on a high note, Andy caught his largest striped bass ever; a long, slender fish that pulled the scales to more than twenty pounds. To reinforce his memory of these powerful fish, he hooked another not long before we had to leave. It was another giant that easily ripped line from his reel as it streaked toward the main lake, then pulled free. It was an impressive way to end a late-summer encounter with one of our most powerful freshwater game fish. So my focus has again returned to the great fall fishing that is about to occur on reservoirs across the south. 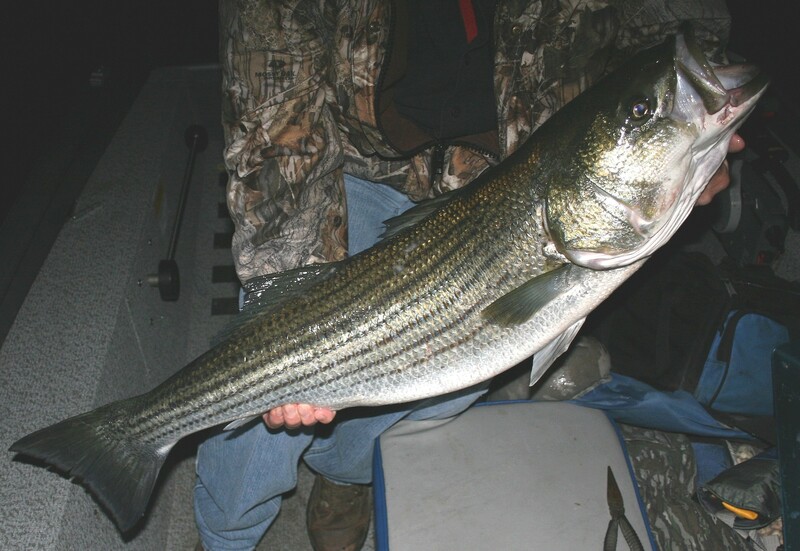 It’s time to renew the search for surface feeding stripers, hybrids and black bass. And very soon, shallow water fishing for largemouth bass will rival the great fishing of spring, minus the heavy fishing pressure and recreational traffic. However, I’m sure it will be some time before our thoughts and conversations drift away from the incredible striped bass fishing we experienced as summer passed to early fall. 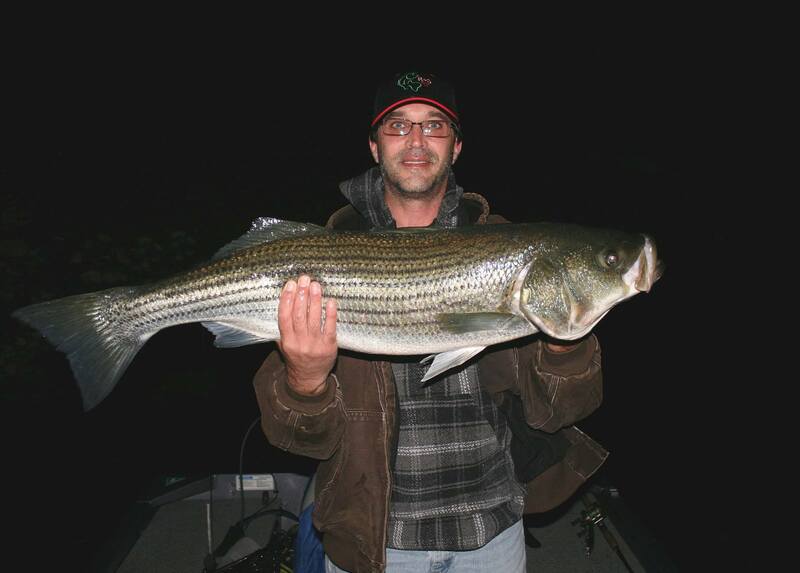 If you’d like to learn more about finding and catching striped bass in small rivers throughout summer, refer to the “Hunting for Trophies” chapter in my book, The Weekend Angler’s Guide To Good Fishing. And if you need help finding some great fall fishing on your home waters, the information you need to get started is there as well. Be safe, have fun and great fall fishing!